“1st All India Kashmiri Pandit Women Conference” organised by Kashmira Vahini was held today on 26-12-2010 in Abhinav Theatre, Jammu. 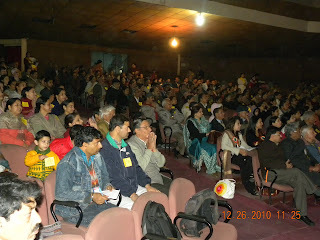 The conference was attended by large number of Kashmiri Pandit women delegates from length and breadth of the country. The conference opened with Mangla Charan - sharda Vandana by the students of S L Memorial Model High school, Bye Pass, Santra Morh; hoisting of flag and Shankh Naad. The highlight of the opening session was the release of Kashmira Devi painting of Virji Sumbly by eminent artist Sh. Gokal Dembi, conferring Vitasta Sukanya Samman on Ms Asha Zaroo renowned Kashmiri theatre personality for her four decades of immense contribution to Kashmiri theatre, radio and television. The award has been instituted by Kashmira Vahini in recognition of the excellence in different fields by Kashmiri Pandit Women. Kirti Kalla patron KV invited the prominent KP saints to the stage for Deep Prajwalan. The first session of the conference was graced by Dr. Ved Kumari Ghai as a chief guest. The other distinguished speakers who spoke on the occasion were Dr. Khema Kaul, Kalyani Kaul and Rama Shah. Smt Sunita Santoshi, General Secretary Kashmira Vahini presented the welcome address and organizational report of Kashmira Vahini to delegates present in the conference. Dr. Khema Kaul spokesperson of Kashmira Vahini on this occasion presented a paper highlighting the challenges Kashmiri Pandit Women are facing in exile and responses to these challenges on social, political and cultural fronts. Kalyani Kaul vice president Oracle finance in her speech emphasized on the KP women to pool in all their resources for collective effort in defeating forces inimical to the interests of KP community. Rama Shah Chairperson Kashmira Vahini threw light on the Cultural Genocide unleashed against KP community and the role of KP women to resist this onslaught and majors to reverse the process of this cultural genocide. Shri B.S.Salathia was felicitated on the occasion for being elected as President Jammu Bar Association. Dr. Ved Kumari Ghai highly appreciated convening first ever “All India KP Women conference” where by various aspects of socio-cultural and political dimensions of the Kashmiri Pandit community especially KP women were highlighted. Smt Sarla Tickoo from Varanasi renowned sport promoter opened the Chitra Darpan, a photo exhibition depicting Kashmiri Pandit women at a glance. The second session of the conference was presided over by Dr. Agnishekhar convener Panun Kashmir. The other distinguished speakers who spoke on the occasion were Dr. Usha Dhar, Dr. Phoola Kaul and Dr. Aruna Sharma. Dr. Agnishekhar in his address exposed the nefarious and reprehensible designs of covertly mixing return of Kashmir Pandit with belatedly granted Employment Package. This move shall be fought and resisted tooth and nail. He also cautioned those representatives of the community who do appear hand-in-glove with such elements. Dr. Phoola Kaul in her address pointed towards challenges facing in exile to maintain a distinct religo-cultural identity. Dr.Bawana Raina presented a paper where in the health trauma suffered by KP women in particular like stress diabetes and skin ailments, hyper-tension, reproductive problems and neuro-psychic related disorders were bane of exile and exodus. Dr. Aruna Sharma, a prominent Dogri & Hindi poet in her presentation mentioned about the cultural and social exchanges and impacts the KP women left on Dogri women and vice-versa. The session concluded with unanimously passing of Jammu Declaration. Smt Sudesha program coordinator presented vote of thanks. Conference concluded with an enthralling culture bonanza Thok-Thok a poetic tribute by Dr. Sudhir Mahajan to late Arjan Dev Majboor was highlight of the session. The other highlights of the session were Udaas Satisar a theatrical performance by J K Bezan and musical concert by famous music director Kuldeep Saproo. Artists who participated include Naina Saproo, Deepali Wattal, Dilip Langoo, Ravi Bhan, Siddharth Koul, Nikhil Majotra, Sunny Koul, Rakesh Kumar Koona. Nice post !! Indian Panditji is famous in all over the world. Astrology is the best way to solve your problems.